Boarding MV Clansman called those unsettling half-dreams to mind; the ones where everything seems the same, but is also somehow different. CalMac’s trademark décor was bathed in the familiar whiff of burned toast. But my instinctive route to the bar ended abruptly in a toddler play area. Children eyeballed me mutinously, shunting colourful blocks of wood along metal wires in a menacing fashion. I didn’t like my chances of getting a Gin and Tonic later on. The ferry was quiet; it being early on a Sunday morning. Most of my traveling companions were either semi-conscious or downright asleep. It was dark, drizzly and there wasn’t much to look at. For the last four years, I have watched our distant sun melt like a Strepsil behind Coll and Tiree. These isles draw a wobbly crayon line on the horizon of my life. I have never visited. 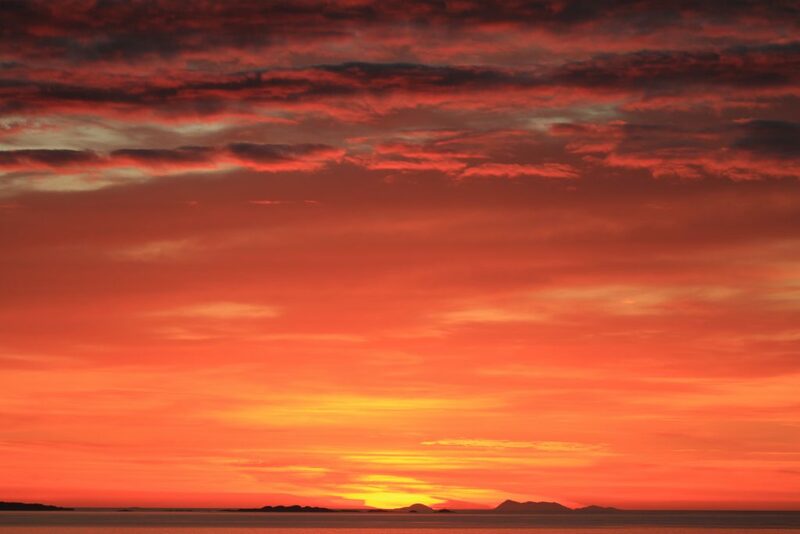 The view from my home on Mull: Despite looking out to Coll, Tiree and the Outer Isles every day, this was my first sailing over. Approaching Coll’s pier on a brisk December day, the paper bags mounted conspicuously to each wall looked inviting: I have robust sea legs, but I bet things get lively during a gale. The moment of arrival saw Gott bay shining like herring skin. Above a bristling lip of marram grass, neat white houses winked at gap-toothed intervals. The air was crisp and brackish on my cheeks. Upon disembarking, the gang plank was ridged with heavy metal grips. I assume these are intended for passenger safety – but I was more than a match for them. John Bowler (RSPB Tiree Officer and interview panel member) waited to collect me at the bottom. I tripped fabulously 80% of the way down the ramp. Unfortunately, I’m only 60% sure he didn’t see. Travel bag safely stowed in the boot of his Landrover, John offered to take me for a spin. I have never enjoyed so many birds with such a magnificently small amount of effort. The golden plover flocks were a marvel: Bursting like mortars from the sand – only to settle again after a few frantic, whistling instants. Sultry clouds of lapwing drifted above. Their handsome piebald feathers batted the salt air like Geisha fans. 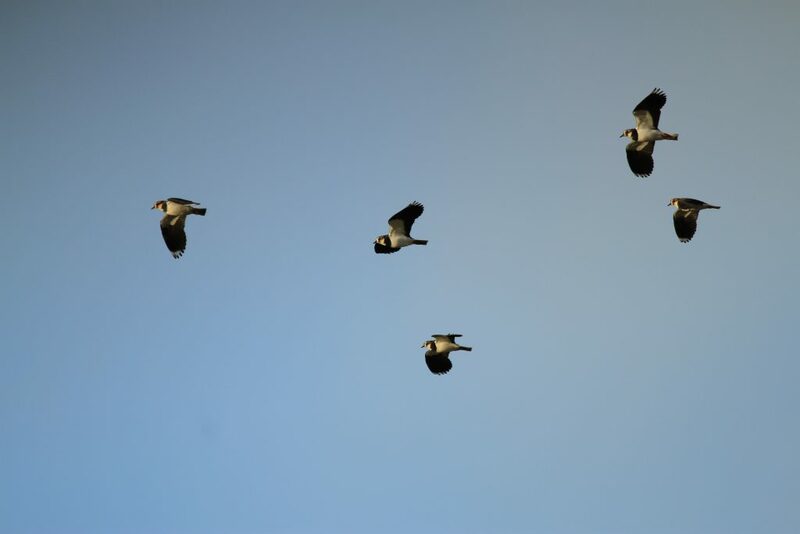 Lapwings, directly overhead on Tiree. They make a wonderful sight as they hunt invertebrates in the pasture. These beauties are my father’s favourite. Over the last decade, his “peewits” have disappeared from our home village. It is sadder and quieter without the fussing pedantry of their nesting. Ribbons of stranded kelp crawled with turnstones. Hundreds of searching beaks and bendy-straw legs swarmed through the rotting heap like termites. These little birds were so wholly absorbed with poking about, they took scant notice of anything else. My hotel room looked over Scarinish beach. After a hot cup of tea, I pulled on a heavy-knit jumper and sallied forth. The sea was inescapable. When by chance the road carried you further inland, pockets of starlings mocked the wading birds. 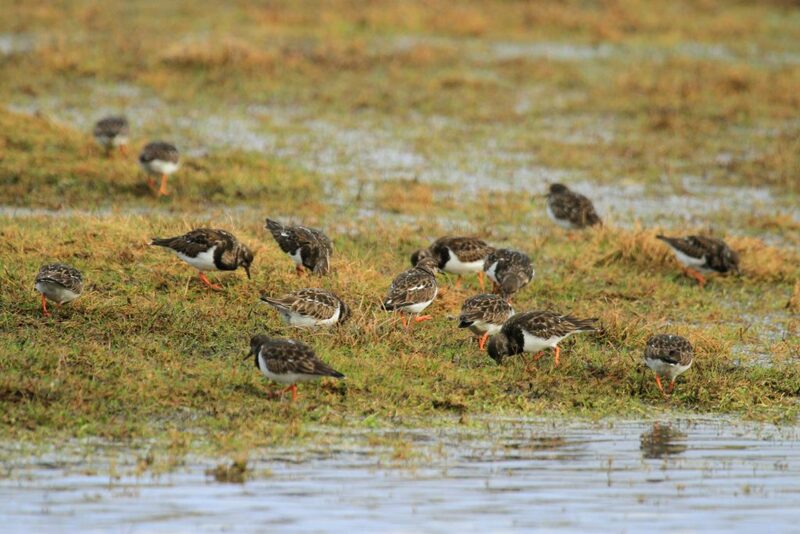 Thus, blended with the bee-bop of their own bright mutterings, it was possible to identify curlew, lapwing, redshank, turnstone, sanderling – even the indistinct mewling of distant gulls. Every gust was heady with the smell of seaweed and sheep poo: A curiously pleasant sensation that made me smile in spite of myself. On Tiree silence inhabits a lower level. Somewhere underneath the hiss of breaking waves and the cold ringing of the wind in your ears, you know it is a quiet place. The island boasts a kind of animated peace – reserved for frontiers in our natural landscape. As I approached Crossapol, well-doing cows trundled hopefully along the road. Behind them, skeins of barnacle geese cackled across the sky like black lint. 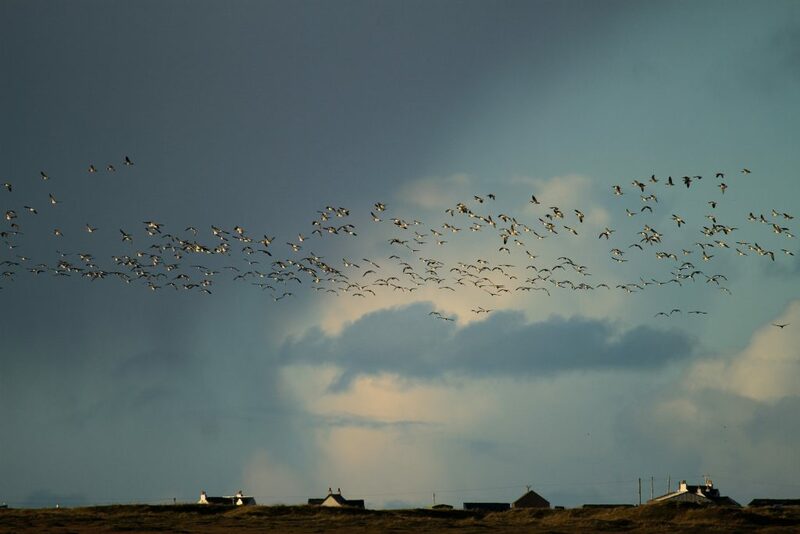 Barnacle geese coming in to land near Loch a’ Phuill. A stirring display of sight and sound. The beach was deserted when I arrived (though the cattle couldn’t bear to leave me alone for too long; they stalked at distance). 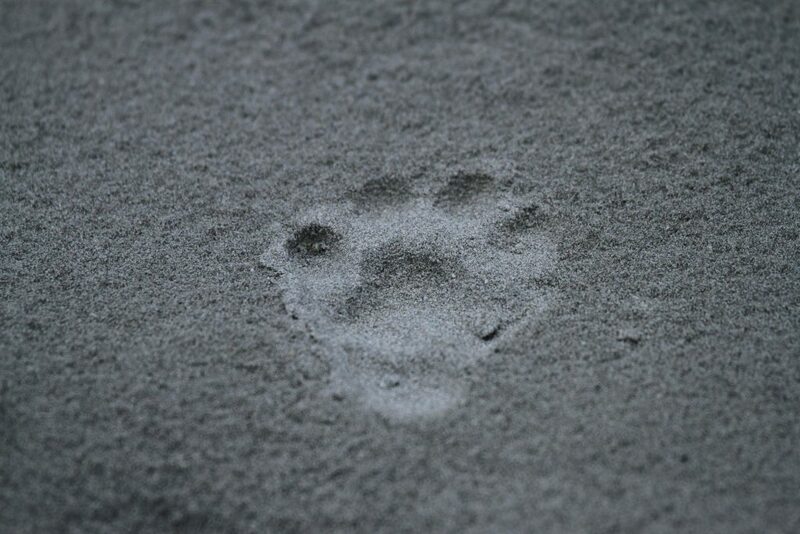 Snaking out of the dunes and down onto the shore, I found the tell-tale drag marks and paw prints of an otter. On the hind feet especially, the webbing that extends between each toe is easy to see. I idled after the tracks, watching them veer towards objects of brief interest (the fleshless remains of a guillemot, the empty carapace of a crab) before losing them to a rock outcrop. Presumably a good spot for sprainting and washing the salt from your fur. Otter tracks are common on Tiree’s beaches. This is a hind left foot, and you can see the outline of the webbing clearly. The light was cooler as dusk rolled in. Glancing back from the raised dune path, I caught the otter slipping into the water at the rocks. It was close to high tide – but perhaps he fancied his chances anyway. 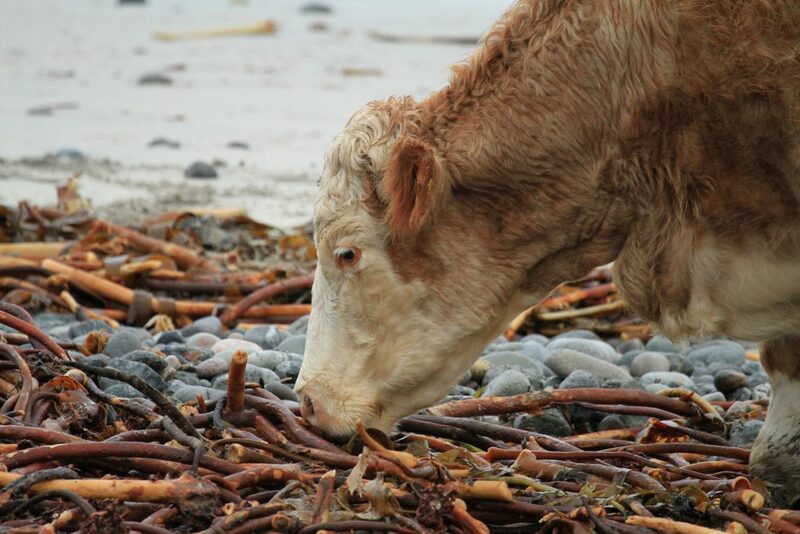 Cattle are often seen munching on stranded kelp along Tiree’s shore. The weed contains salt and useful minerals. The cattle made much of being “surprised” to see me again; kicking their heels and enjoying the excuse to be skittish. Offshore, a party of eider ducks crooned with approval. I turned up my collar and thrust my hands into my pockets. Ostensibly, the magic of the evening had affected everyone. Driving to the ferry after my interview the next day, I asked Paul what it was like to live on the island. He replied: “Tiree is a place of moments”. At any given time, a nuance of wildlife or weather will produce an instant of breath-taking loveliness. These moments are as fleeting as they are frequent. Watching wading birds pour down like confetti from the heavens, I really couldn’t have said it better myself.